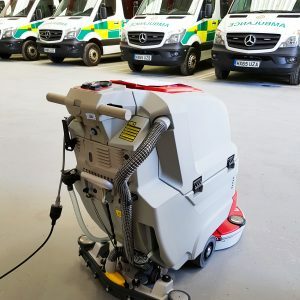 We were pleased to supply a new Scrubex 40:500E to an ambulance depot in Newbury this month. The Scrubex 40:500E has a 500mm working width disk brush and a pressure die-cast aluminum frame that guarantees reliability and sturdiness over time. Intuitive drive, with simple controls, ensures the machine is easy to operate, and the compact size and silent operation of <66 dB(A), makes it is versatile enough to meet the cleaning needs of several sectors!